A small evergreen shrubby plant from the Canary Islands, Isoplexis canariensis is the best known species however a number of other garden worthy varieties are also offered by wholesalers. Related to foxgloves they are a brilliant flowering perennial. Easy to grow in a well drained soil they are becoming increasingly popular with Australian landscapers for their tough drought tolerant nature. Species to differ in foliage and flower structure, Isoplexis sceptrum being a softer look in the garden than others. All species grow well in full sun to part shade and all require protection from frosts. Flowering in summer a little additional water in long dry spells may be required, mulching around plants is usually sufficient. All species add a sculptural aspect to landscaping projects including good flower displays. 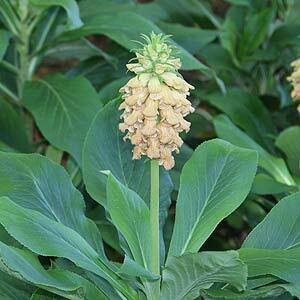 Isoplexis sceptrum- Large textural foliage, a flower that looks like a pineapple before it opens to a large mass of orange to creamy yellow blloms. Isoplexis isabelliana – Narrow foliage with a red flower spike, excellent in a dry sunny to part shaded position.